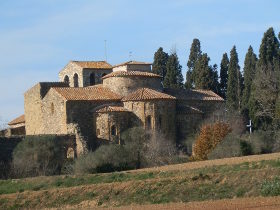 Cruilles is an ancient village just to the west of La Bisbal d'Emporda both of which are important in Emporda's medieval history as locations of lords and bishops, and as such there is a timeless beauty to what the rural countryside in this area stretching across ancient meadows and into the slopes of the Gavarres Hills. 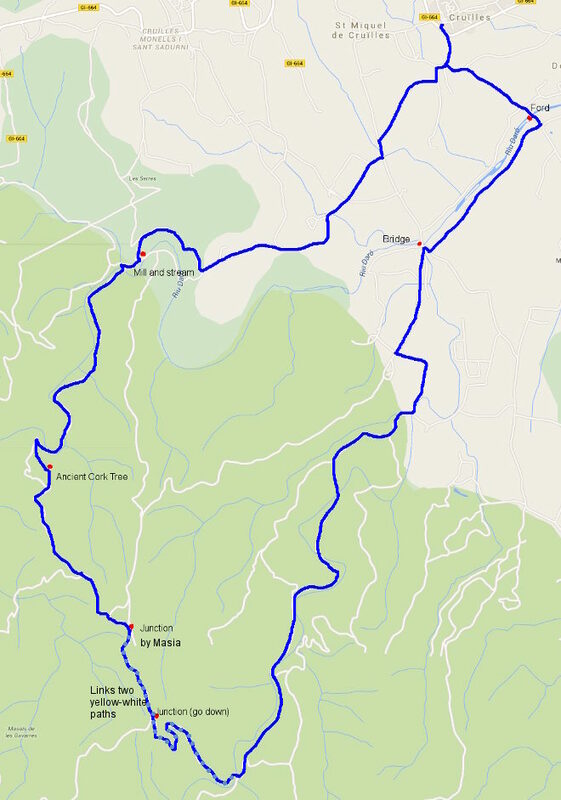 The route we're taking consists of two yellow-white senderisme paths which follow river valleys and which are connected with a route over the top of the hill that separates them. The route is broad and well maintained with markings are clear and easy to follow with signposting at crucial junctions, so it's actually easier to walk than describe. It is marked in yellow on the Emporda Costa Brava maps, but difficult to work out from Google maps. We're walking in January which is currently very warm - 14-15C, but there is still water in the streams and the paths are lightly muddy rather than the dry summer sand and dust. We had to cross a lot of streams and fords which was fun, but many of the streams would probably be dried out in summer. 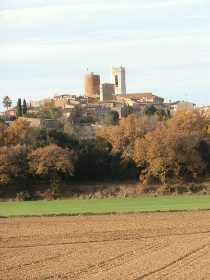 We park just outside the centre of Cruilles just off the road to La Bisbal d'Emporda. 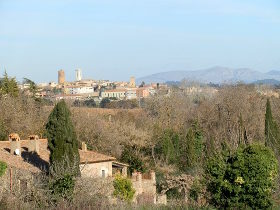 We've included a visit to Cruilles in a previous walk for a fuller description of the town and its famous tower, but this time we were more interested in heading out into the countryside. The initial part of the walk is on a quiet road and splits just in front of a masia farmhouse. We take the right fork and continue along the road and through the fields and meadows towards the next old farmhouses. These masias are large buildings with thick walls and small windows sitting under long sloping roof. Close to the sea the buildings have towers added on that would have been used to watch for pirates, but here tucked away towards the hills they are just large practical buildings built three or more centuries ago to work the surrounding land. Many have now been updated and renovated into luxury houses with large gardens and pools, but it is also still possible to find masias in a more original state. The path we're taking is marked yellow-white and is clearly marked. At prominent junctions there are also signposts, so it's easy to follow the route as it crosses a couple of more junctions. 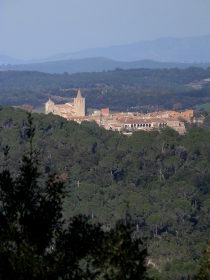 Behind us we can see Cruilles and it's tower and church, and next door the older more isolated church of Sant Miquel de Cruilles. At this stage we're still in fields, but we can see woods ahead of us as we move towards the slopes of the Gavarres and see the domed tower of Puig d'Arques almost straight ahead. The path runs past another masia and converts into a gravel track then a little further on branches to the right and climbs a thinner walking path until we are above the top of an old mill and millstream giving views into the Gavarres valleys and back to Cruilles. Coming down the track we pass the outer wall of the mill - almost like a ha-ha (a wall with a ditch on one side) and what looks like a traditional charcoaling oven. 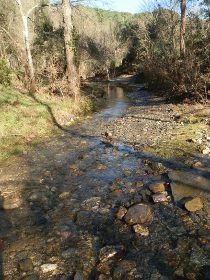 At the end of the wall we find the stream that feeds the mill - a glistening early stream that forms the River Daro as it passes past La Bisbal downstream. We don't have to cross this time and can just admire the location - but there is water in the stream in January and to get across we have to tiptoe over the rocks in the stream. This is now just the first time we'll see water. As we go on, the path runs into the woods continually cutting across the stream line. Mostly the track goes through the water of the brook, and in drier periods it is most probable that there would be no water to worry about. We have the fun of creating stepping stones with great splashes that delight our dog. One of the oddities of a warm January afternoon in the woods is that in the sun we have proper warmth, but in the shadow and shadier parts there is a frisson of chill. Close to the stream at one point we even found frost on the ground and a mystical mist rising from the water into the still cold air. After about 3-4 crossings, the path turns upwards and into the hills giving views of a more isolated masia hidden in the woods. The path runs up to the top of the hill and about half way up we pass what seems to a very large and very old oak. The top of the hill gives further views and we can see to Sant Sadurni, the neighbouring village to Cruilles and more hidden masias in the valley. Across the top of the hill, we look out for the crossing points as we want to change paths. The first crossing point is just by the fence to another grand masia and on a good drivable track. This road then takes us down the hill a little to the next crossing to the left, where the sign has fallen down, but would point back towards La Bisbal. The return through the woods is a pleasant stroll along the bottom of the valley but lacks the fun of crossing the stream that we had in the other valley. Eventually the path emerges back into the fields and now pig farms before tracking to a large walkers bridge over the Daro. The bridge looks much too big for the amount of water, but we know that in heavy rains, many of the rivers quickly become swollen which is probably why the bridge needs to be so high and long. We divert along the side of the river through the woods instead of going straight back to Cruilles - we can see a river crossing on the map. However, when we get there, there's another minor problem - the river is up and the crossing we can see is a ford. Luckily we find another few bricks in the shallower water and can cross without getting feet wet and have an easy walk back to the car.